OSWEGO — SUNY Oswego’s GENIUS Olympiad has chosen as finalists 248 science, art, creative writing and architectural design projects from around the globe, and will invite their high school-age authors and the students’ mentors to spend June 24-29 in Oswego. 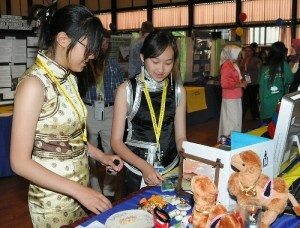 At SUNY Oswego's inaugural GENIUS Olympiad last summer, Mongolian high school students Alungoo Battokhtokh, left, and Anu Yavuukhulan prepare an exhibit titled "Mongolia Nomadic Pollution," about the overall effect on native peoples and the environment of industrialization, factories and deforestation. The global environmental competition's academic committee has selected 248 projects in science, art, creative writing and architectural design, inviting student finalists and their mentors to Oswego for the 2012 finals June 24 to 29. Finalists hail from 49 countries — from Albania to Vietnam — and 32 states, Damkaci said. They and their mentors must register by May 25 to attend finals week. Students who attend the second year of the GENIUS (Global Environmental Issues — U.S.) finals will present a public viewing of their projects from 6 to 7:45 p.m. June 25 in the Campus Center arena and — after two days that include judging, an international fair, tours, a basketball tournament and shopping — will appear from 1:30 to 3 p.m. June 28 in Tyler Hall’s Waterman Theatre for the awards ceremony. “The inaugural year of the GENIUS Olympiad drew 342 students, parents and other mentors to campus. It provided a gathering place for young scientists and artists with a passion for solving environmental issues “to share their work and create a better future,” Damkaci said. New this year are categories for creative writing — poetry, short story and non-fiction essay — and architectural design, urban planning and interior design. Young photographers were eligible to submit science-related photos in a subcategory of the art competition. GENIUS this year also offers international finalists an opportunity for a three-week English program on campus after the competition. Teachers who accompany student competitors may attend a two-day workshop. Registration deadlines for each are April 23. The scholarly focus remains on science and the environment, and competitors from high schools worldwide were invited to submit projects in the categories of environmental quality, ecology and biodiversity, human ecology and resources and energy. SUNY Oswego and the not-for-profit Terra Science and Education Foundation, whose volunteer board provides science assistance to K-12 schools and school boards, organize and sponsor the GENIUS Olympiad, with additional sponsorship from Syracuse Research Corp., International Wire Group, Hong Kong Innovative Technology and Education Association, Airgas and WCNY.